‘As a composer, Paulus seems to be on the same wavelength as Benjamin Britten.’ So commented a reviewer in the Chicago Tribune following a performance of the Jesu carols by the William Ferris Chorale in 2001. It is perhaps unsurprising that the combination of voices, harp and medieval Christmas texts would draw comparison with Britten’s famous A Ceremony of Carols; however, Paulus’s handling of these elements is quite different, not least making much use of a full choir rather than simply of treble voices. 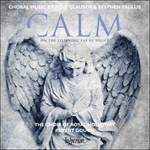 Paulus is no stranger to Christmas music, and has arranged many of the familiar carols. But the Jesu carols are anything but familiar. At the first performance in 1985 the William Ferris Chorale also sang William Mathias’s Ave Rex, a work that also features four medieval texts. In an interview before this shared performance of Paulus’s Jesu carols and his own Ave Rex, Mathias described how he liked ‘using medieval words partly because you’re slightly distanced from them, or at least the words are not sentimental’. This noticeable lack of sentimentality is apparent in Paulus’s choice of text in the first carol, Jesu’s lyfelyne, by a medieval prioress, which is rather more like a list describing the lineage of Jesus than a charming carol text. An anonymous text from the sixteenth century brings us the rousing sailor song, The ship carol. The rippling harp accompaniment effortlessly carries the singers along their journey during which ‘Our Lord harped, our Lady sang’. There is much bleakness and poverty in Robert Southwell’s New prince, new pomp (written shortly before his execution in 1595) and in his setting of part of this poem, Waye not his cribb, Paulus reinforces the contrast between the babe’s divinity and humble humanity by opposing stark dissonance with untainted major tonality. This is carried right through to the final chord where, against the concluding pure fifth of the upper voices, can be heard a tonally opposing chime from the harp. Word-painting abounds as the composer moves through the narrative of the final movement, The neighbors of Bethlehem, a translation of a thirteenth-century French carol. The piece is wound up with two lines of text: ‘God hath appeared on earth below’, set for lower voices, and with ethereal bitonal harmony the upper voices sing ‘O come ye shepherds, wake, arise!’. A distinctive motif (heard in the soprano solo) unifies the movement, and provides a final call in the harp part over the last chord. Jafeth come Abraham, Moses, Aaron and the Prophets. Of whom that gentleman Jesu was borne. On Christ’s Sunday at morn. Awaking all in slumber lying? O come ye shepherds, wake, arise! And now is born in manger lowly! Yet how divine in beauty bright. And Joseph with the gentle mother. A palace fair for greatest king!